Travel Online offers a great selection of accommodation in Port Douglas all throughout the village and the surrounding areas. No property is allowed to be higher than a palm tree and helps Port Douglas keep its laid back atmosphere. Right here we offer you the whole range of Port Douglas accommodation from budget apartments all the way up to luxury resorts. You can also use the resorts map to find the holiday location in Port Douglas thats right for you. At the Mango Tree Holiday Apartments offers fully self contained 1 & 2 Bedroom Apartments and Townhouses. Located on the popular Davidson Steet, with a local bus stop at the gate, making it easy to explore Port Douglas. Self drive visitors are also catered for at this Port Douglas accommodation with undercover parking available. Take a dip in the salt water swimming pool or unwind in the poolside spa. Experience the unique ambience that is Port Douglas from Beaches Port Douglas a luxurious property right on the beachfront at Four Mile Beach. This Port Douglas accommodation complex consists of 24 luxury 2 & 3 bedroom units which are fully self contained with private balcony. Facilities include a large pool and spa with BBQ area, a beachfront cafe, and is located only a few steps from the swimming enclosure for year round swimming in the Coral Sea. Cayman Villas Port Douglas are located within walking distance of the Marina, Four Mile Beach and cosmopolitan Macrossan Street, where you will find an array of boutique shops, restaurants and bars. Offering guests luxury 1, 2 and 3 bedroom self contained villas that feature very large living areas and large tropical balconies. Superbly located on Mowbray Street, Port Douglas, its just an easy 5 minute walk to the village centre. Central Plaza Apartments Port Douglas are located just 3 minutes walk to 4 Mile Beach and 5 minutes to the restaurants, cafes, bars and boutique shops of Port Douglas Village. This resort offers guests fully self contained apartments with private balconies and facilities including a pool, outdoor spa and BBQ area. From here you can easily access tours to the Great Barrier Reef, Daintree Rainforest and Cape Tribulation. Club Tropical Resort is well located in the heart of Port Douglas with a range of self contained studios and apartments. Set amongst lush tropical gardens, this Port Douglas resort offers guests great value for money accommodation in a convenient location. Coconut Grove Port Douglas is located 140 metres from Four Mile Beach and offers guests luxuriously appointed 1, 2 & 3 Bedroom Apartments. Each apartment has full kitchen facilities and offer views of the rainforest or the ocean. The resort features a stunning lap pool, retail shops, restaurants and cafes. From this Port Douglas accommodation you can access an array of day tours to the Great Barrier Reef, Kuranda and the Daintree Rainforest. Garrick House offers 17 superb fully self-contained studios, one and two bedroom, and penthouse apartments - the ideal Port Douglas accommodation. An excellent property in a good location just 200 metres from beach and 5 minute walk from the town centre. Hibiscus Resort & Spa is a Balinese inspired resort set in exotic tropical gardens, a short walk from Four Mile Beach, the Marina and the main shopping area of Port Douglas. Accommodation choices range from self contained Studios to 1, 2 and 3 Bedroom Apartments. Each apartment features air conditioning, kitchen facilities and balconies that catch the beautiful sea breezes. Onsite facilities include 2 swimming pools and a wading pool, 2 cold spas, guest laundry service, a tour desk, day spa and a poolside breakfast restaurant. Le Cher Du Monde is adult only Port Douglas accommodation ideally location on Macrossan Street which is in the centre of Port Douglas. The famous Four Mile Beach is just minutes away and is the perfect place to spend a relaxing day. The Apartments at Le Cher Du Monde feature full kitchen facilities and are furnished in a light and airy tropical decor. Facilities include a tour desk, swimming pool, bbq area and undercover parking. This Port Douglas accommodation offers affordable apartments that within walking distance to the beach, restaurants and the town centre. Lychee Tree Holiday Apartments features one and two bedroom apartments with full cooking and washing facilities, TV, DVD player and private patio or balcony. This is a great place to base yourself while exploring Tropical North Queensland. The 1, 2 and 3 bedroom luxury Port Douglas accommodation boast calm classic interiors of shell and stone accented by furnishings in aquamarine, celadon and natural teak. Mandalay Luxury Beachfront Apartments offers absolute beachfront luxury accommodation perfect for a self-catering Port Douglas holiday. Mantra Aqueous on Port is located just off Macrossan Street, and provides the ideal setting to enjoy the distinctive tropical atmosphere of Port Douglas. Mantra Aqueous on Port offers guests rooms and apartments each with their own balcony and spa and some also feature direct pool access. With the Great Barrier Reef and Daintree Rainforest on its doorstep, Port Douglas is one of Australia's most popular holiday destinations. From its central location within Port Douglas, Mantra Heritage provides the ideal base to explore the natural attractions of Tropical North Queensland, from the wonders of the Great Barrier Reef to the Daintree Rainforest. Mantra Heritage offers guests a choice of hotel rooms to self contained 1 and 2 bedroom suites with kitchenettes, balconies and whirlpool spas. Facilities include a lagoon-style swimming pool, spa and BBQ facilities. Conveniently located on Davidson Street - just a short walk from the heart of Port Douglas village. Mantra Portsea consists of Hotel Rooms and 1 & 2 bedroom apartments. The PortSea offers the ultimate in convenience, luxury accommodation and style with facilities such as a central lagoon pool with spa, fitness centre, pool bar, Portsea Beauty and Spa and a tennis court. Mantra in the Village is perfectly positioned to immerse yourself in the world renowned restaurants, boutiques, galleries and laid-back cosmopolitan ambiance of Port Douglas. Mantra in the Village offers guests a choice of Hotel Rooms and 1 and 2 Bedroom self contained Apartments. Facilities include a Mediterranean-style swimming pool perfect for relaxing in after a full day on the Great Barrier Reef, touring the Daintree Rainforest, or relaxing on the golf course. Mantra on the Inlet offers guests the perfect location to experience everything Port Douglas has to offer. From its prime position on Macrossan Street, the resort is just a short stroll from Dickson's Inlet and Port Douglas' world-famous restaurants and shopping. Mantra on the Inlet features a choice of Hotel Rooms and 1 and 2 Bedroom Spa Suites with traditional colonial-style architecture and modern trimmings. Facilities include an outdoor pool, BBQ area, in-room internet access and complimentary parking. The Meridian Port Douglas offers luxury boutique studio and1 bedroom apartments. This Port Douglas accommodation is situated within walking distance of the marina, where the Great Barrier Reef cruises depart from, spectacular Four Mile Beach is only 200 metres, and the cosmopolitan main thoroughfare, Macrossan Street, is a short stroll away. Perfect for a romantic getaway or couples retreat. Enjoy the quiet serenity of your luxury self-contained apartment, only 100 metres from famous Four Mile Beach and a short walk to the centre of Port Douglas village where you will find a wide choice of cafes, bars and boutiques. The perfect Port Douglas accommodation for your perfect tropical holiday. Enjoy the tropical weather and relaxed atmosphere of Port Douglas from Nimrod Resort Apartments, situated a short stroll from famous Four Mile Beach. This popular Port Douglas accommodation offers comfortable, self-contained apartment style accommodation and features a large lagoon style swimming pool and beautiful, lush gardens. Peaceful, natural surroundings whilst indulging in luxury villa style accommodation, this is what you will find at Niramaya Villas and Spa. Open, spacious designed villas offer a relaxed atmosphere with private plunge pool and courtyard gardens. Port Douglas accommodation at its finest. Oaks Lagoons is a 4 and a half star resort-style holiday apartment complex, perfectly located just a 500 metre walk from famous Four Mile Beach and Port Douglas. Port Douglas is known as the most popular accommodation base from which to explore the Great Barrier Reef and rainforests of The Daintree. Oaks Resort Port Douglas is nestled in the warm heart of tropical North Queensland, close to the relaxed seaside village of Port Douglas. This Port Douglas resort also offers an extensive day spa facility, a lagoon pool, bar, a restaurant and lounge bar and poolside dining facilities. A short stroll from the famous Four Mile Beach and just 10 minutes from the centre of Port Douglas, Paradise Links Resort Port Douglas is the perfect place to rejuvenate in privacy and comfort. Paradise Links Resort Port Douglas offers a range of accommodation from hotel rooms, apartments and villas, surrounded by tropical gardens. Facilities include a tennis court, swimming pools and BBQ areas. Peninsula Boutique Hotel Port Douglas is a small boutique hotel perfectly located on palm fringed Four Mile Beach with fine restaurants and cafes just a few steps away. With just 34 self contained suites, Peninsula Boutique Hotel Port Douglas offers a unique concept in Port Douglas accommodation - the facilities associated with a hotel plus the intimacy only a small property can provide. 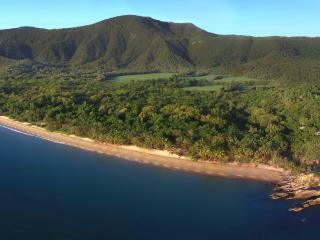 Peppers Beach Club is located overlooking Four Mile Beach in the heart of Port Douglas. Laze away in the sun on your private swim-up pool deck or stroll through the resort's elegant grounds. Choose from a Spa Suite or 1, 2 and 3 Bedroom Suites, each featuring lagoon views, beach views or garden views. Facilities include Sublime Bar & Grill Restaurant, Exclusive Spa, gymnasium, lagoon pool and 24 hour reception. Set in lush, tropical gardens, Pink Flamingo is a unique Boutique Resort located in cosmopolitan Port Douglas just moments from Four Mile Beach. Pink Flamingo offers secluded accommodation studios and villas. Children under 18 years are not catered for. The Pool Port Douglas offers 2 & 3 bedroom modern self catered apartments just a few minutes drive from the centre of Port Douglas. Relax around the resort length pool and enjoy the hotels tropical setting. Do as little or as much as you want with the Great Barrier Reef & World Heritage Rainforests on your doorstep. Restaurant, cafes & shops just a short drive from resort, make Port Douglas the perfect location for a relaxing getaway. Port Douglas Apartments are located 100 metres from famous Four Mile Beach and centrally located to all that Port Douglas has to offer. This Port Douglas accommodation offering 17, self-contained 1 bedroom apartments featuring the best in amenities and facilities. The restaurants, bars, and boutique shops are all within walking distance from Port Douglas Apartments. Located in the centre of Port Douglas Village, Port Douglas Palm Villa's twenty one units are within walking distance to the beach, restaurants, shops and the marina. Upon entering the accommodation building, a large indoor atrium of towering tropical plants sets the scene for the cool, relaxing atmosphere. This Port Douglas accommodation is perfect for couples who want self catering facilities. Port Douglas Retreat offers air conditioned studio style units. This Port Douglas accommodation features a heated swimming pool & BBQ facilities that are surrounded by lush tropical gardens. Port Douglas Retreat is located only 3 minutes walk to Port Douglas Village and ideal for a relaxing escape in Port Douglas. Port Douglas Sands Resort offers 52 one, two and three bedroom apartment accommodation, spacious in design and well appointed to meet the needs of today's family holidaymaker. 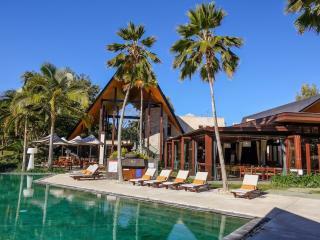 This Port Douglas resort also features beautiful tropical gardens, swimming pool, spa and BBQ area. 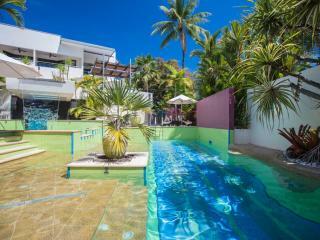 This Port Douglas accommodation ids ideally located just 400 metres from Four Mile Beach. 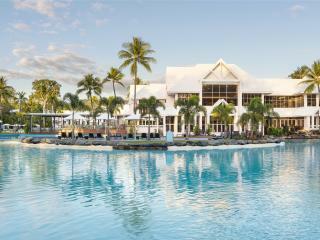 Pullman Port Douglas Sea Temple Resort & Spa is set on almost 10 acres of tropical beachfront on Four Mile Beach. 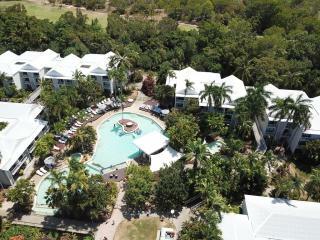 Offering spacious and stylish Port Douglas accommodation including studios, 1, 2 and 3 bedroom apartments and villas. This Port Douglas resort has it all, including an 18 hole golf course, luxurious day spa plus much more. Ramada Resort by Wyndham Port Douglas has 190 rooms and its very own superb signature restaurant, day spa, and beach club. Set amongst huge native fig trees and groves of paperbarks, the rooms are airy, spacious and well appointed. 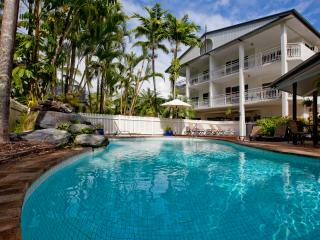 This Port Douglas Accommodation is 5 kilometres from the town centre and located right on Four Mile Beach. Located close to Four-mile beach and a few minutes stroll from the village atmosphere of Macrossan Street. 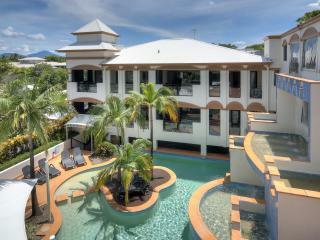 These Mediterranean style apartments reflect the airy tropical style of Port Douglas. Relax on your own private balcony or by the swimming pool on the surrounding green lawns and timber sundeck. Reef Club Resort Port Douglas is the perfect place for couples or families to base themselves when discovering tropical North Queensland. This Port Douglas accommodation offers a fantastic place to base yourself for a relaxing tropical North Queensland escape. Explore the World Heritage Listed Daintree Rainforest & the Great Barrier reef, both of which are in easy reach of the Reef Resort Villas Port Douglas. Choose from 1, 2 & 3 Bedroom Villas that feature self catering facilities plus enjoy the use of the onside facilities including a cafe, BBQ area and lagoon swimming pools. One of the most unique properties in Port Douglas, the Regal Port Douglas exudes tropical South Pacific comfort and style. Located right at the start of the restaurant strip on Macrossan Street, only a short stroll to Four Mile Beach, The Reef Marina and Sunday markets, The Regal Port Douglas offers guests a choice of Studios and 1 & 2 Bedroom self contained apartments, all with balconies and either outdoor jacuzzis or indoor spa baths. Located in Port Douglas, Saltwater Luxury Apartments comprises of 2 and 3 bedroom luxury holiday apartments offering every desirable comfort. Ideal for couples, families or groups after self catering accommodation in Port Douglas, Saltwater Luxury Apartments is close to many Port Douglas attractions including Four Mile Beach, Reef Marina and plenty of shops and restaurants. Superbly positioned between the palm-lined Four Mile Beach, trendy restaurants in Macrossan Street and The Reef Marina, Seascape Holidays - Coral Apartments features tropical landscaping and a sparkling pool, BBQ area and more. Shantara Resort Port Douglas is a small boutique resort-style complex, that caters for couples and the independent traveller looking for tranquillity and personal service. Located within walking distance to Macrossan Street and an array of quality restaurants. Famous Four Mile Beach is a short stroll away and the Marina is also close by for daily departure to the Great Barrier Reef. Featuring Hotel Rooms and self contained 1 Bedroom Apartments, and facilities such as a gymnasium, and pools, this Port Douglas accommodation is the ideal place to base yourself to enjoy the restaurants, art galleries and shopping of North Queensland. This Port Douglas accommodation is the perfect place to base your next family holiday, couples getaway or group trip to Tropical North Queensland. 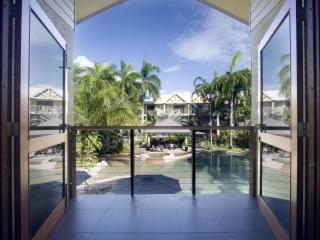 The Sheraton Grand Mirage Resort Port Douglas is set on a large slice of beachfront heaven in Port Douglas. The resort boasts easy access to the famous Four Mile Beach and also offers a wide range of facilities and room types. For your next holiday to North Queensland to explore the rainforest and the Great Barrier Reef why not stay at Sheraton Grand Mirage Resort Port Douglas. Thala Beach Nature Reserve is a private and tranquil resort, built on a rocky ridge surrounded by tropical rainforest, eucalyptus woodlands, creeks and mountains that plunge into the sea. Situated on 145 acres and fronting a spectacular and private 2 kilometre sandy beach, looking out to the Great Barrier Reef. The Lodge features 85 luxurious bungalows and suites with views of either the treetop canopy or the Coral Sea and is only a 15 minute drive from Port Douglas. The Pavilions is truly in the heart of Port Douglas, just a 5 minute walk to the famous Four Mile Beach, restaurants and sidewalk cafes. Offering studio, one and two bedroom apartment accommodation, The Pavilions has everything you need and desire for an unforgettable Port Douglas holiday.